We will be holding a Race Night on Friday May 29th at the club to raise funds for our Academy. · Attend the event on the night! 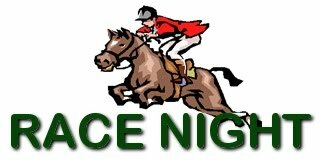 There will be full bar facilities available and this Race Night promises to be a great night for all. We know we can count on your support to make this a successful and enjoyable event. Please ask your friends, family and colleagues to come also. The more people we have the more enjoyable the night will be. Phone 086-2315332 (Tony) or 086-0308909 (Liz) for more info.